The differences over the S4 introduced by Lotus on the Sprint were integrated over a period of time. Most of the changes were made to production cars by mid 1971. Later changes made during the Sprint’s production run are also included below. The bonnet reverted to a flat design, losing the bulge incorporated to clear the Stromberg carbs on S4 engines. Some of the S4/Sprints retained the bulged bonnet and equally, some early Sprints appear to have had the bulged bonnet fitted, perhaps as stock got used up at the factory. In addition, improved bonnet catches were used. The Lotus steel wheels were painted black and fitted with stainless Rimbellishers. Again, some of the early Sprints, as well as the S4/Sprints, had the previous model’s silver painted wheels, probably as stock was used up. The duo tone paint livery was also introduced at this time. Reflecting the sponsorship of Lotus’ Formula One team by cigarette manufactures Players, the Gold Leaf (a well-liked brand of Players at the time) red over white was a popular colour combination. The join between the two colours was covered by gold sidewinders, with “Elan Sprint” written on them. Apparently the line between the two colours was not always as sharp as it should have been when it came out of the paint shop, so the sidewinders covered any quality issue. However, it should also be borne in mind that the gold stripe was a feature of the Team Lotus Gold Leaf livery any way, though not as wide as the Sprint sidewinders. Looking at contemporary photographs, it clearly took the factory several months to get the positioning of the sidewinders just right. An optional extra cost, single (mono) colour paint scheme was also available. When the cars left the factory, they were sprayed with a protective wax, Autokote 9, which was removed by steam cleaning by the dealer prior to handover to the customer. The World Champions Constructors badge, reflecting Lotus championships up to 1970, was fixed to the right hand front wing. A redesigned badge, reflecting the 1972 World Championship, was also produced. Since that was won in September of that year, it may be that these badges appeared on Sprints produced from mid to late November 1972 onwards. 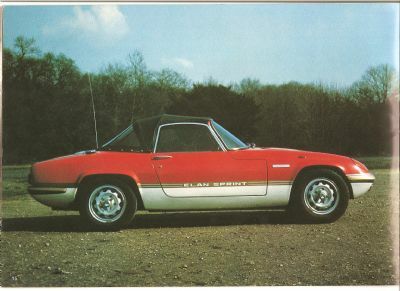 The Lotus Elan Sprint badge was fixed to the left hand front wing. In the case of the handful of Sprint/5s produced at the factory, a Sprint/5 badge replaced the Lotus Elan Sprint badge for mono tone coloured cars; for duo tone coloured cars it replaced the World Champions badge. The only badges to the rear of the car were the Lotus letters on the boot lid. Carrying on the gold theme, the front and rear bumpers were recoloured from silver to gold. The side indicator repeaters were changed to a slightly flatter design. The headlamp unit specification was changed during 1972. Front indicator light lenses were changed some time in late 1972 from a conical shape to a slightly flatter style with a spiral pattern on the inside. Drain holes in the doors were modified. The lower body stainless strip fitted to S4 S/Es was never a Sprint fitment. A small protruding lip around the bottom of the rear valance appears to be a Sprint mould difference. S4 bodies do not have this lip and we can only assume that a new mould or part mould was used that resulted in this lip showing. It was painted white for duo tone coloured bodies and the body colour on mono tone bodies. For cars manufactured after 1 January 1973 reflective number plates had to be used in the UK, so rigid plates were fitted to the front of late cars, replacing the individual digits on the engine intake grill. Sprints had the ignition switch integrated into the steering column below the dashboard (though some of the later S4s also had them – those due for European export to France & Germany). Some early Sprints and S4/Sprints had the ignition on the dash. The bonnet release pull was re-located onto the dashboard. Sun visors were standardised as a fitment in the Sprint from mid 1971. The handbrake handle type changed from Ford style white insert to Ford style all black, some time in late 1971. The seats incorporated a device, a simple lip along the edge of the runners, to prevent them tipping forward, as per Federal spec cars. The steering wheel centre boss became larger, flatter and incorporated a smaller Lotus emblem. This emblem was encircled by firstly a mottled vinyl rim, later a plastic item with radiused lines was used. The steering wheel was covered in a plastic material, not leather. Leather rims had been an option on S4 SEs, though. The steering wheel also had small black covers over the smallest holes, closest to the rim. Early Sprints had S4 steering wheels, which had a more protruding boss of smaller diameter and lacked the small hole covers. Then the new pattern wheels were used but the protruding boss retained, presumably as stock was used up. The final style was in use for all Sprints by December 1971. All had the signature of Colin Chapman etched into the down spoke. The Lotus twin cam engine power was increased by 20%. The twin cam cylinder head was reworked. In addition to enlarged inlet valves, the compression ratio was increased by skimming the head, the cam shafts were further modified for improved torque and the port shapes were refined. Weber 40 DCOE 31 carburettors replaced the S4’s Stromberg products. In conjunction with the work carried out on the cylinder head, the jets and chokes fitted to the Weber’s were different to those fitted to previous versions of the twin cam engine. In turn, the Weber carburettors were replaced by Dellorto DHLA 40’s in around May 1972. A service bulletin detailing the changed specifications was issued on 9 June 1972 so Dellortos must have been fitted to Sprints in the factory by May 1972. Dellortos were fitted by Lotus to the Twin Cam Europa from December 1971, so clearly Dellorto was a factory supplier by then. One reason for this change was that Dellorto had been quicker and more willing to change their designs to meet the new European regulations that were due to come in force. They may also have been cheaper than Webers too. Dellorto DHLA 40Es were used on all ECE 15 engines, which were really the same as domestic engines but had different carb jets and ignition settings to meet euro specs. Some of the last Big Valve engines for the domestic market had European specification carbs. A stiffened, redesigned Big Valve cam cover replaced the earlier engines cover. The Big Valve cam covers, up until August 1972, were always black for UK spec cars. European and Federal cam covers were red. However, some red covers, perhaps on those engines with European specification carbs, were also used on domestic cars, though there seems to be no formula as to whether a UK Sprint had red or black covers after this date. Additionally, the fins on the cam covers and the “LOTUS Big Valve” legend became more sharply defined, with the Lotus font changed, the legend also being read from the cabin end of the car, having initially been read from in front of the car, at some time in mid 1971. Presumably new castings were made, either by a new manufacturer if they were outsourced, or by a change in casting at the factory. Apparently only 50 cam covers were made to be read from the front, perhaps so that it was easier to read when viewing the car at motor shows! From mid to late 1971 the HT leads were lead up over the cam cover and through the centre of the inlet manifold to the distributor, having always previously been lead under the web cast at the rear of the cylinder head. The fail safe distributor rotor arm (rev limiter) was modified to be activated at 6750rpm instead of 6500rpm. The exhaust pipe silencer unit became a straight through single unit, replacing the twin pipes of the S4. The intermediate pipe was also lengthened and a heat shield fitted above the silencer. A blanking panel was fitted below the radiator to improve air flow. The electric cooling fan motor, brackets and fan were changed. Nearside engine bay heat loss holes were standardised in the Sprint. Drive shafts had a fail safe device fitted, the purpose of which was to hold the shaft in place if the Roroflex coupling broke. Revised front brake calipers were fitted. The differential mounting was strengthened by inclusion of a brace between the top mounting points. The European spec also included a hazard switch and light system, the switch being mounted below the ashtray, between the fan and lamps switches. The instrument bezels were recessed flush with the dashboard. Federal Sprints retained the Stromberg carburettor setup and included crossover pipes to feed heated air into the inlet manifold. Thus the bonnet bulge was retained on Federal Sprints. These engines also had different timing, compression ratio and cam shafts fitted. As with the domestic Sprints, early Federal Sprints were S4 bodies with Sprint mechanicals; indeed some Federal S4s were changed to Sprint spec by the factory. The majority of the following differences were introduced on Federal S4s (and some on the S3 SS models), but I have no specific data on when exactly. Running lights were fitted to the rear flanks and front set of fenders (bumpers), the sidelight fitting was omitted, leaving a blank in the fibreglass, the hazard warning switch was fitted as well as hazard, handbrake and brake fail lights on the dashboard. The bonnet pull was located on a bracket under the dashboard, below the warning lights. The instrument bezels were recessed flush with the dashboard. The glove compartment door was fitted with a lock. Failsafe headlights with a single vacuum cylinder were fitted, which meant that the headlights rose up if the car was not used after a period of time. Dual circuit brakes were fitted with a larger plastic master cylinder. Hexagonal nuts replaced spinners for the road wheels. The rear lamp cluster had different bulbs and direction lights fitted and operated from a DB10 relay box. The seats had an extended integral headrest in their design. In addition to the VIN plate in the engine compartment, there was a vehicle identity plate fitted at the base of the windscreen, which gave just the unit number, as well as a manufacturers plate located on the inside of the drivers door opening, which gave the month and year of manufacture, as well as the unit number and a Federal emmissions plate on the intake side of the engine compartment.